While many of you may be in the Christmas, hunting, or hibernation mode, we’re still getting out on the water as much as we do in the heat of the summer around here. Winter time in the Destin and Panhandle area is one of the best times to be on the water. The boat traffic is at a minimum, the fishing is fantastic, and you have a chance to fish in certain ways that you can’t in the warmer months. One of my favorite things to do this time of year is to pick a sunny day, light north wind, and hit the beach sight fishing for schools of big bull redfish. It’s advantageous to have a 2nd station tower on your boat to see better, but it’s not a must. I usually start right outside the Destin pass and fast idle down the beach either way. You’ll be looking for a gray colored shadow in 5-15 ft of water. 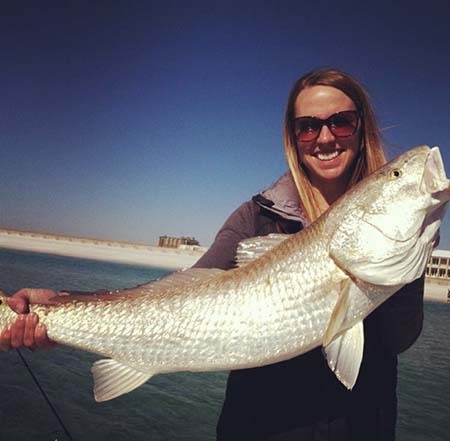 Destin “Off Season” Fishing – Redfish Are Stacked Up! Typically, the redfish will school up in 50-200 fish schools, so they’re relatively easy to find. Once you find them, put down your trolling motor and try and stay just inside casting range of them. You can throw top water, suspending lures, swim baits, live bait, etc; they’re not real picky. If you stay away from them and try and finesse fish that school, you can catch them for hours. Since you’re on the shallow sandy bottom, there’s nothing to hang up on, so I like to use really light tackle and have some fun with it. We’ll use 6-10 lb mono or braid main line or even throw as small as a 6 wt fly rod. Most fish are weighing between 10-30 lbs, so be ready for a fight! Of course there’s so much more to fish for, but, while these redfish are stacked up like they are on the beach, it’s time to get after them while you can!